Choosing a monument, memorial or marker to honor a loved one should be carefully thought out beforehand. To begin with, the cemetery you choose will have certain gravesite regulations that will affect what you can and cannot do. 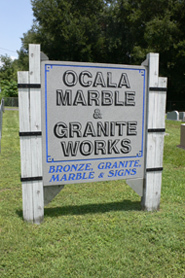 At Ocala Marble & Granite Works, we’re intimately familiar with each cemetery and memorial garden and their regulations, so we can advise and guide you properly in your selection regarding your compliance with these regulations. 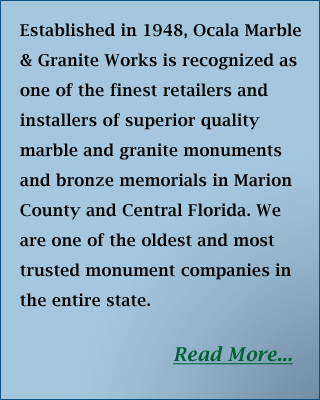 We have placed more than 20,000 monuments in cemeteries throughout Florida.